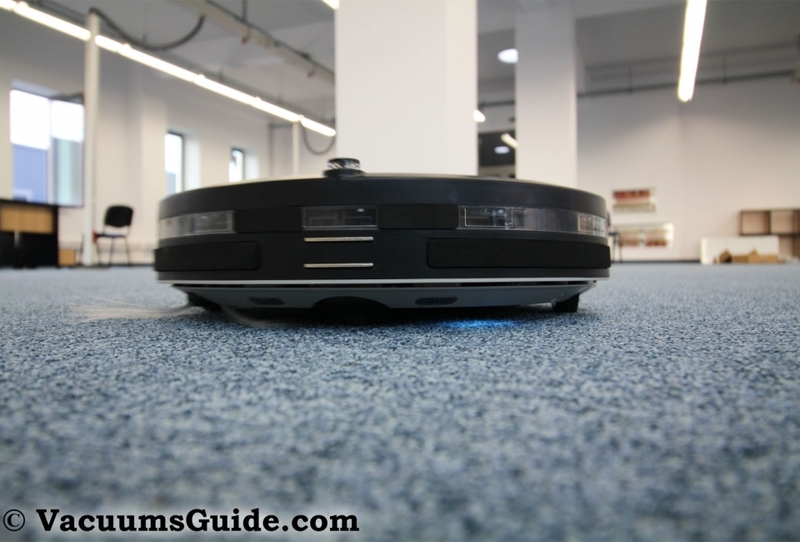 The SeeBest C561 completes the line of robot vacuums produced by this company. If the D730 was especially good on bare floors, this new product works just as well on hard floors, as it does on carpets. A large air intake, powerful suction and lots of extra features are among its strong points. Given the large air intake you can see in the images and the video above, it was clear that SeeBest needed to deploy a powerful motor. A double turbine motor which can be easily unmounted from the back of the dust recipient ensures the efficiency of this product. The suction is about 400 Pa strong, but coupled with a brushroll system similar to what we see in premium models from iRobot (made from 2 separate brushrolls – one standard, one made from rubber), it delivers a high cleaning power. As you can see in my tests, it even outperforms the 1000 Pa iLife A4 in some of the trials. In order to achieve these good results, another thing which may contribute is the floating brush, which auto-adjusts based on the type of floors, to offer an even better cleaning. When the floor surface is even, the brush automatically adjusts close to the floor and when it encounters uneven plans, the brush and the suction inlet vary their height. The 14.8 V/1500 mAh Ni-Mh batteries offer between 90 and 120 minutes of continuous cleaning (depending on the type of floors). When the battery is low, (less than 20%), the cleaner automatically seeks the charging dock station. It can find it without you manually interfering, if it’s less than 16-20 ft away. It takes about 4-5 hours to recharge the battery completely. The adapter can be connected either to the charging dock, or directly to the robot. At this moment, I couldn’t find an adapter for US outlets, but this can be resolved with a simple EU-to-US adapter. SeeBest C561 has a 12 oz (350 ml) dust capacity, which is decent for general cleaning. It could have been larger, but a big part of the plastic bin is occupied by the vacuum motor. Just as it is with all the other robot vacuums, you may have to empty this dust recipient between cleaning cycles, especially if the amount of dirt or dust is overwhelming. The process of emptying the bin is simple and straightforward. Moreover, the bin is removable and washable, meaning that you can easily keep it clean and ensure that the cleaner stays at optimum performance. First of all, I bet you’ll enjoy using the 2.4 GHz round wireless remote controller. You can directly tele-operate the robot in different directions, within a distance of 33 ft. (10 meters). The two main wheels are equipped with shock absorbers and also adjust to floor heights. The robot can climb a 15-degree slope and obstacles which are less than 0.5 inches (12 mm) high. SeeBest C561 has is anti-fall and anti-collision sensors, which prevent the robot from falling off the stairs and running into obstacles. An automatic virtual wall also can prevent the unit from cleaning a specified area. The robot has 2 cleaning modes to choose among: the Spot Mode and the Auto-Cleaning Mode. When in auto-cleaning, the robot can randomly perform various types of movements (spiral, zig-zag, winding, or edge cleaning). These ensure an excellent cleaning coverage rate. The movement speed can also be adjusted: 1 for high speed, 2 for low speed. You can also program this robot vacuum cleaner to clean at a certain time. The filter is located inside the dust bin. Although the C561 doesn’t come with a HEPA filter (the producer says it’s a HEPA, but it’s in fact a standard 1 layer-washable), the one installed is effective and easy to maintain (washes and dries quickly). Generally speaking, all the allergy aggravating contaminants are successfully trapped by this system. As you may already know, weight isn’t always a decisive factor when you go for a robotic vacuum cleaner, since you’ll virtually never have to lift it while cleaning. However, you may want to move it around from time to time, and that is why I’m still listing these values. The SeeBest C561 weighs 7 lbs (3.2 Kg), with 12.6 inches in diameter and 3.43 inches in height (32 cm / 8.7 cm). Anyone and everyone can handle it with ease. The dimensions also allow for easy cleaning under most furniture pieces, quick storage, and low maintenance. A 1-year warranty covers SeeBest C561 customers. If any problem occurs before the warranty period expires, you are required to take videos or photos of the particular problem and send them to SeeBest for verification. The company will then send you replacement parts free of charge. Unfortunately, the producer hasn’t added any kind of batteries (for the remote control and for the virtual wall). The robot has an UV light which kills some germs and bacteria. Although it’s small, the dry mop is a nice touch. The virtual wall can create a barrier 26 ft (8 meters) long. Users can select among 2 movement speeds. The unit can work directly after you get it outside the box (although I recommend you to let it charge completely before the first use). I’ve measured the sound produced by this robot vacuum at 66 db. At this value, the unit is not very noisy. The robot is powerful enough to climb over carpets, wires and so on. Accessing the brushrolls is easy. Be sure you remove the hair entangled in these at least once per week (depending on the usage frequency), in order to protect the robot and to maintain it “healthy” and ready to work. This unit is perfect for carpeted areas, as well as bare floors. It can handle space of 1300 sq ft (120 sq m) without any problem. The recharging process is dependable. I’ve found the best deal for this unit at GearBest.com. The SeeBest C561 has a good cleaning power. The parts are easy to take out and mount back it. An elastic bumper protects the surface of your furniture. The self-adjusting cleaning head enables it to traverse different floors. The cleaning speed is adjustable to either slow or fast. The error code display function enables users to troubleshoot and solve problems with ease. SeeBest C561 (C565, C571) is offered in multiple colors, including White, Red, Golden and Black. The LCD screen shows time, power display, working mode selection, working error code and charging alert. It can’t climb over thick carpets. It doesn’t come with AAA batteries. It doesn’t have a HEPA filter. What do you think about the C561? Would it be a good match for your home? Do you already own one and want to share something with us? Please use the comments form to send your input.